The exponential increase in computer tomography (CT) and magnetic resonance imaging (MRI) has lead to a significant rise in the detection of asymptomatic adrenal masses. The prevalence of adrenal “incidentalomas” is approximately 4%-10%. We present a case of a 55 year old male with a large 7 by 7 cm right adrenal mass that was followed by serial CT scans and multiple non-diagnostic CT guided core biopsies. 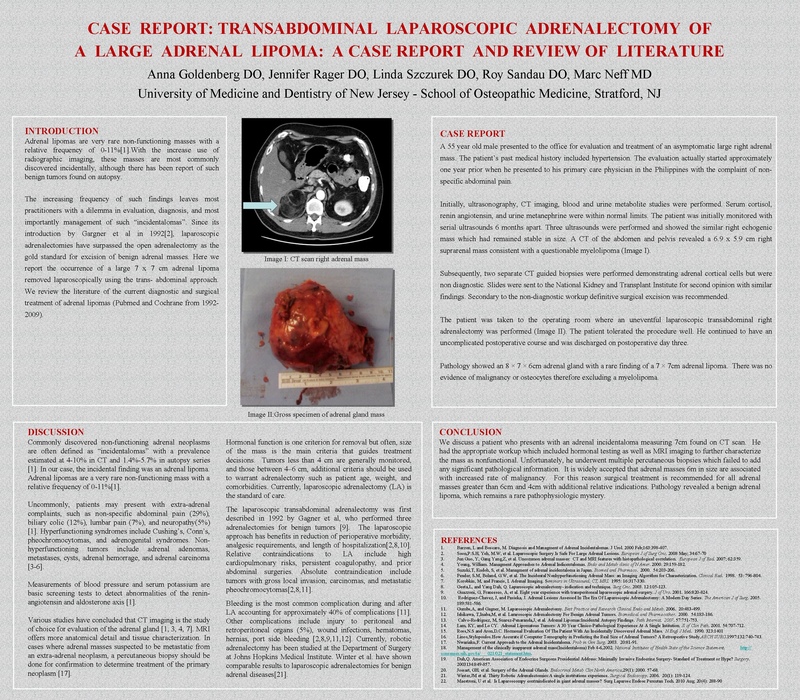 Due to the large size of the mass and unknown pathology, the patient underwent successful transabdominal laparoscopic adrenalectomy. The patient’s post-operative course was uneventful and he was discharged home on post-operative day number three. Pathology results from the adrenal mass revealed an unusual finding; a large adrenal lipoma. Adrenal lipomas are rare, benign, non- functioning tumor like lesions that occur with a relative frequency of only 0-11%. We performed a comprehensive literature review (Pubmed and Cochrane from 1992-2009) of the current diagnostic and surgical treatment of adrenal lipomas.